As the early winter sky darkened, clouds hovered overhead and the first flakes of snow drifted gently to earth. Time to set a fire in my blackened brick fireplace. This is not a normal fireplace. Our house has a Rumford, named after the Anglo American physicist Count Rumford. Since the 1790’s the Rumford fireplace has been found in many fashionable homes. Thomas Jefferson incorporated a Rumford at Monticello and Thoreau praised this fireplace, known for its shallow angled sides reflecting heat into the living room and carrying away smoke. Some people install gas fireplaces with pseudo flames but these fail to bestow the mellow feeling that satisfies on a frigid day. Only a genuine fire embraces the home with a warmth and the rich fragrance of burning logs. There are several ways to start a fire. 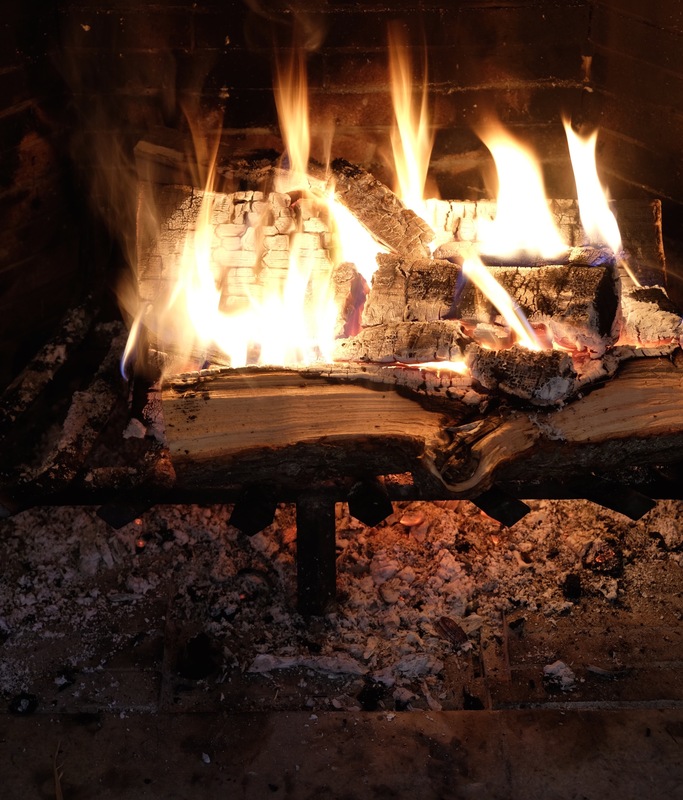 In this day of technology, and the desire for instant gratification, simply place strips of fat wood under the logs, light and the result is immediate. However, for the purest, the first step involves crumpling pages of a newspaper. Any section works. Some people prefer the Sports Section where a photo portrays a basketball player leaping high as a flame. Others choose the Style Section for, if a woman’s fashion is really “hot,” that presages the quality of fire! I prefer the Food Section to accompany my chestnuts roasting on an open fire—as the song extols. And, for those reluctant to escape reality, the ideal section is the News of the Week, since that section gives a slow, and sometimes not too slow, burn. Layered on the newspaper I placed woodchips or, perhaps, the bark of a dead birch tree that fell in a wind storm. Then, I struck a match. Long matches permit ample opportunity to kindle paper and wood shavings but a short match provides an unequaled challenge—usually causing frustration because the match quickly flickers then goes out. This is a race against time! While the match sputtered, I reminded myself that in life new beginnings are often not easy and patience is a learned attribute. Finally, the flames danced up the chimney and I relaxed in my soft leather chair, drank a mug of hot cider, stirred the chestnuts and petted my dog Coco who nestled close to the soothing heat. But, as time passed, I left the fire to wander into the meadows where Elgar and Pokémon searched for grass but settled for hay, as frost subdued the fields. Then, to my dismay, when I returned I was aware that no one had tended to the fire. Night had encircled the living room and the light, a gift from the Rumford, had been extinguished. My first reaction? Gather more paper, trim another strip of bark and start all over. But, when I removed the screen, I noticed that in one corner of the ashes a spark still glowed. From that single spark I revived the fire and soon, darkness expelled, I again delighted in an early winter fire. Settling in, I wondered, is it possible that there is always the spark of rebirth if only we search among the ashes of what once was? Hopefully the answer is yes. December 4, 2016 in Brant Lake.